UPDATE: Great news! According to the developer @aplusatwork (via Twitter) on-the-fly handwriting will be released free of charge in February 2015. 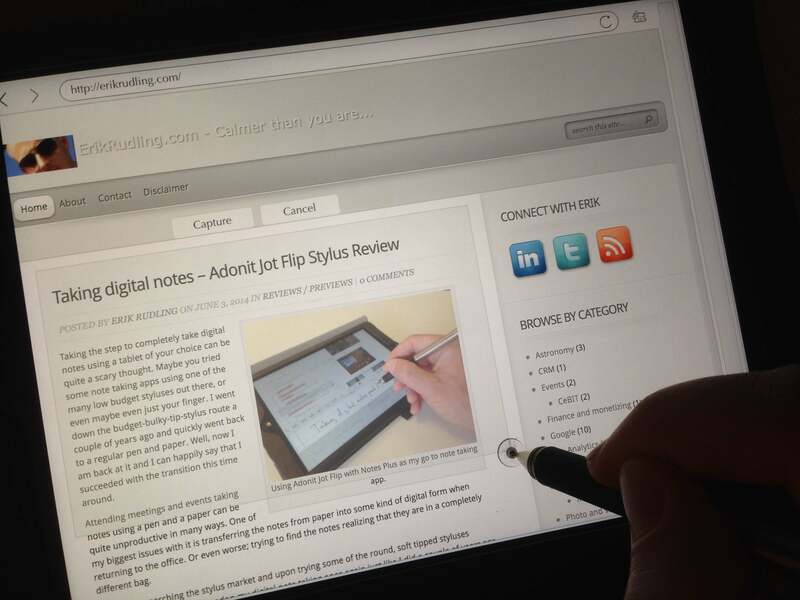 If you’ve read my positive review of the Adonit Jot Flip stylus I bet you are curious about what app I use in my digital note taking endeavor? Be curious no more! As usual, final verdict and links at the bottom of the post. 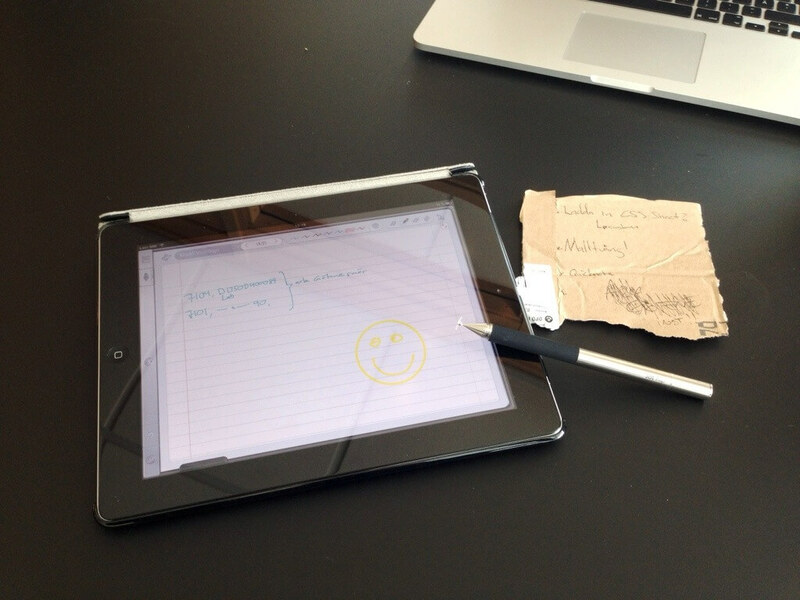 A good combination of analog and digital notes? Picture from an early attempt with an older gen iPad with a backup cardboard notepad, happy to say now I’ve gone completely digital. 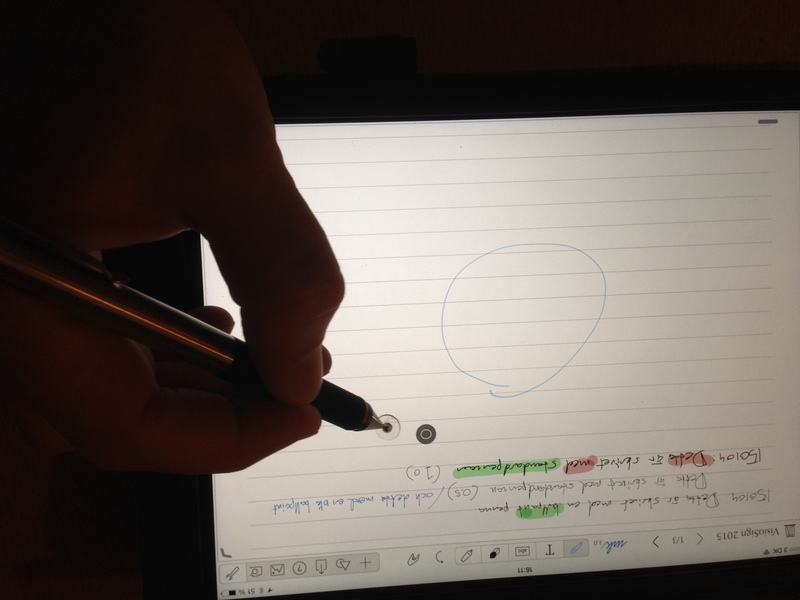 Notes Plus is an iPad app that allows you to sketch and take notes with ease. Even though that is the main purpose of the program I find myself using some of the, to my knowledge, unique features as well; such as the built in web browser with quite advanced copy / paste features. The app also offers the much needed zoom feature that actually makes your scribbles somewhat readable and not giant doodles that could’ve been made by the neighbours four-year-old. Synchronisation to your favourite cloud storage and PDF-support is, I suppose, almost standard today. Read on for the full review! Because that is what it is all about, taking notes. 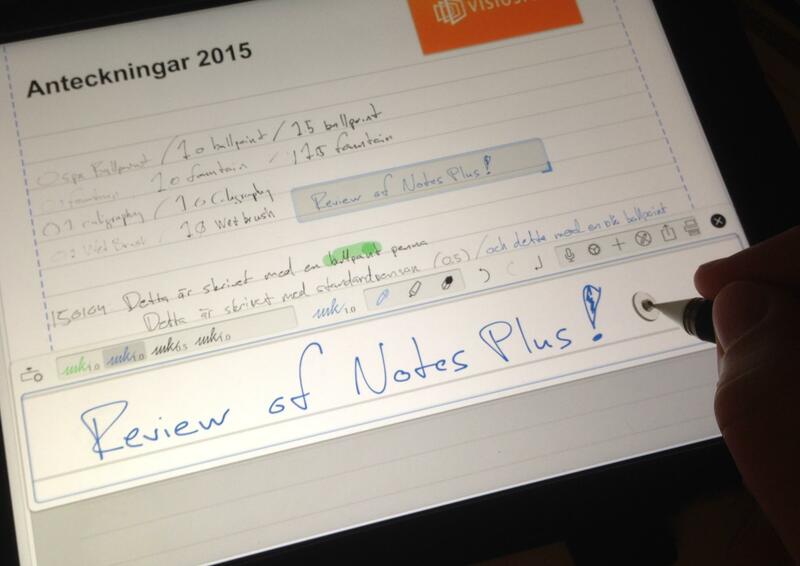 There is something about Notes Plus that makes the whole writing experience a breeze. I have tried several others, some came close (Good Notes) and some focus more on the sketch book experience with different coloured crayons and image related features. When you start taking notes it will inevitably look like a young child writing its first words. Large, shaky and uneven characters will fill up the screen until you fall down on your knees crying…Well, ok maybe not, but not far from it. Zoomed in view allows you to write BIG characters, but they are represented on “paper” as normal sized characters. 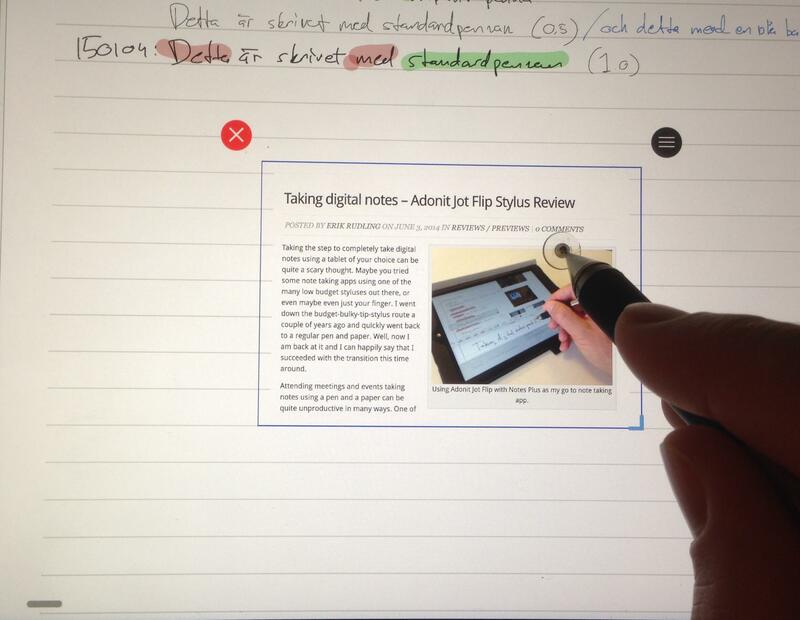 Therefore Notes Plus and others with them have added a feature called zoom, where you can zoom in on the paper. You can then proceed to write your large letters, numbers or sketch as usual within this zoomed in view and it will actually turn out alright when viewed zoomed out. It is the only way I take notes now. In Notes Plus you can configure how much zoom you want PLUS you can also get the app to automatically proceed to the next row or the next section of the page using a smart overlay system. Basically what this means is that progression through your notebook is seamless, you do not need to zoom in and out each time you proceed to the next row or even press enter. Another point worth noting, there is no need to press any button in Notes Plus to access the zoom-feature, you just press for a couple of seconds on the screen and BAM you’re in zoom mode. No extra steps to be taken, I like that. Even this poor attempt at a hand drawn circle is recognisable by Notes Plus, clicking the little circle in the right will convert it to a real one. I think that these small details, like the zoom and the row-progression mentioned above combined into one package is what makes me like Notes Plus so much. Apart from the standard (it is what I have come to expect from any note taking app) features above Notes Plus also has some gesture based features. If you want to erase a word for example, just imagine you turned your pencil so that the eraser end is in contact with the screen and make erasing movements up and down the word and it will be erased. Quite smart and to make it easier you can also just make a zig-zag horisontal move and the word will be erased, so instead of finding the undo or eraser button, usually several clicks away, you can do this inline, neat stuff! I will have to admit, I don’t use it that much, I still tend to find undo or the eraser, but I am sure this feature will grow on me. The above principle can also be applied to shapes. So if you draw a circle, square, triangle or rectangle Notes Plus will detect your poor attempt at a shape and suggest an improved one, by the click of an inline button, your shape now looks perfect. The newly created shape can be resized and scaled freely, this also goes for any handwritten text or sketches that you circle, you will get an option to resize and move that chunk of text anywhere you want. It’s good, it’s just that perfect combination of analog and digital, hand in hand, the notes look like your normal notebook scribbles but you can just take them and place them anywhere. However, the shape recognition is something that I actually think worked better in GoodNotes at the time with a big BUT, you need to actively select a shape detection button and then start drawing shapes, in Notes Plus you just draw them and it detects it automatically. I’m a big fan of reducing the amounts of steps and clicks it takes to get something done so Notes Plus wins this one anyway. Selecting an area of a website to bring into your documents is a very intuitive process. I already mentioned the built in web browser. This is one of the features that I tend to show people as a “power feature”, so maybe not the first thing that comes up but after showing the actual notes, moving them around and zooming in and out it will be brought up. It does take the app to a whole new level. A quick swipe from the left to the right of the screen takes you straight to a built in web browser where you can enter a URL to a website. Maybe it is a company that you are discussing at a meeting? Browse in there, long click on any image on their website and just chuck it to the right of the screen and voila, that picture is now in your notebook where you can freely resize and place it to your liking. It creates a sense of recognition, a way to instantly recognise what meeting you were in when writing the notes when you quickly browse through your notebook. Inserting a selected part from a website into a Notes Plus document is a breeze. text, it will be transformed into regular, searchable text. A great feature and it actually works really good. I tend to use this just to convert the title of the meeting or the location where I am at just to be able to find it easily when searching an exported PDF for example. Cloud sync is in here as well and I have Notes Plus automatically syncing to my Dropbox. No matter where I am, as long as I got internet access, I can access my notes. Either through the automatic backup folder on Dropbox where every page in the Notes Plus notebook is stored as an HTML-file but also if I decide to export the notebook as a PDF I can access it from my Dropbox giving me a range of powerful tools such as searchable text. It is some powerful stuff and I have used it many times when following up on meetings and seminars, no more “where did I put those notes again?”. What is the best way to learn a new subject, profession or habit? ErikRudling Thanks so much, Erik for your time reviewing Notes Plus. We’re intrigued by the detail level in your article. Great review! ErikRudling We’d like to let you know that we’ll include the Handwriting Recognition into Notes Plus without in-app purchase starting Feb.